In the United States, Flag Day is celebrated June 14th every year. It commemorates the adoption of our Flag of the United States which happened June 14th, 1777. In 1916 Flag Day was proclaimed by Woodrow Wilson. Driving by one of our stores you will notice the largest American Flag in the county flying high above. We are Georgia Floors Direct, and we’ve been flying the biggest flag in the county for years because of what it means to each of us. In our company we have a few Veterans but most of us are just proud Americans. The Flag represents to us a symbol of freedom. The Flag means Honor. It fills us with national pride. Some people fly their flags on June 14th to celebrate Flag Day. But around here, just look up any day of the year. We always have her up and waving in the wind. We have people who call and thank us. Please check out this article from a passerby? This tells it all! Every day for the past 16 years I’ve motored my way to work down 17th Street, greeted faithfully each morning by a familiar and comforting old friend. Then one day a couple of weeks ago, that old friend was suddenly not there. Gone. Its absence was glaringly obvious. It was impossible to not notice.So I stopped at Georgia Floors Direct and asked an old acquaintance, manager Jerry Jones, what the heck happened to my friend, the big flag that flies 24/7, 365 days a year in front of the business. Turns out, they had to take Old Glory down because one of the flag pole clamps that hold the flag had broken and it had to be specially ordered. It was down for four days, and it left a hole on the horizon as I came over the MacKay-Wiliams bridge from U.S. 441. I wasn’t the only one who noticed, either. Jones said he received numerous calls from people in the community asking if the flag, advertised as “Marion County’s largest American flag,” was being taken down for good. Jim Stringfellow, whose Gainesville company owns the Ocala and four other George Floors Direct stores, said he first started flying a big flag at his Savannah, Georgia, store back in the 1990′s. It was so popular and such a visible landmark for the business that he put them up at two of his other stores, including Ocala. I asked Stringfellow if he did it because he was a veteran, and he said no. He’s not a veteran, just a proud American. “It means a lot to the veterans, but doesn’t it mean a lot to all of us?” he responded. The short answer is, well, yes. Obviously. Of course, anything worth doing usually isn’t easy. And flying a 60 foot-by-30 foot flag — that’s the size of the 1,800-square-foot house — falls into that category. “We work hard at it,” Jones told me. To begin with, making a repair, or just changing out the flag, is a five- or six-person task because of the size of the flag. Jones said he goes through three to five flags a year because they get tattered flapping in the Florida breeze. So he keeps five in stock. Stringfellow buys the American-made flags from an Ohio-based flag manufacturer and spends about $2,000 per flag. The big flag, which waves from atop a 90-foot pole, is indeed a landmark in Ocala. It first was raised on Sept. 11, 2002 — the first anniversary of 9/11 — complete with a blessing from former First Baptist pastor Ed Johnson. Since then, it has waved continuously, except for repairs and during hurricanes, and provides those who pass by it with a sense of security and patriotism. Well, the good news is our old friend, Old Glory, is back. The better news is it’s obvious Jones and Stringfellow take pride in their iconic flag and it’ll be here for a long time. “We love sharing it,” Jones told me. And I am grateful they do. 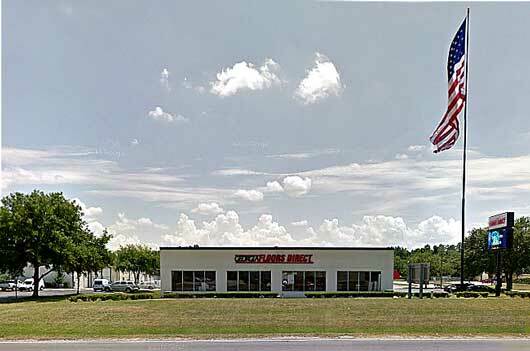 Our Ocala store, and that great big flag.